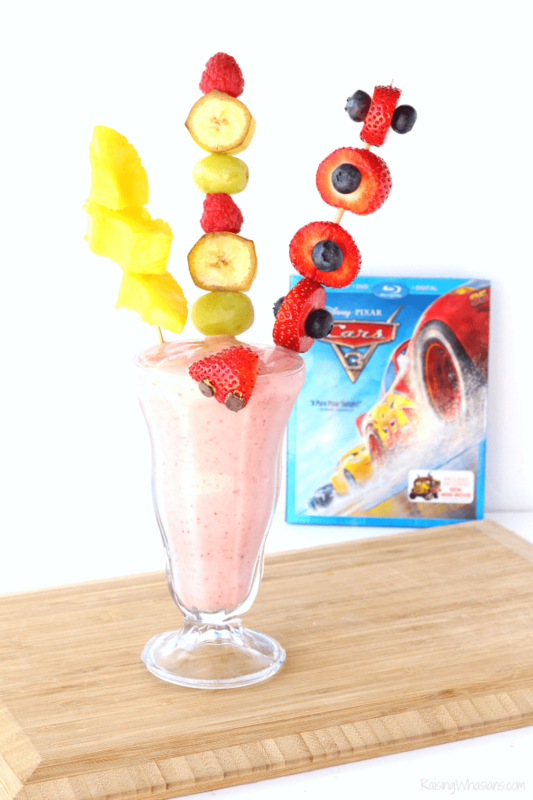 Celebrate Cars 3 on Blu-Ray November 7th with this Fabulous Lightning McQueen Smoothie! This post is sponsored by Disney. All delicious and magical opinions are my own. May contain commissioned links. Disney Cars was the first movie that my son cling to as a toddler. We watched the movie on repeat for years, always clutching a Lightning McQueen car in his hands. It’s amazing to see how much Cars has grown with my son over the past 9 years. now full circle with Cars 3. I got to see a glimpse of that sweet innocent toddler boy when we got to see this classic story come back to life on the big screen this summer. And now? I’ve got one happy 9-year old, coming back to his “old friends” once again. Having Cars 3 as a part of our Disney movie collection solidifies my son’s eternal love for McQueen, Mater, Hudson Hornet and now some new friends like Cruz Ramirez. We make a point every year to stuff my kids’ stockings with a movie. And I’m so glad Cars 3 is now available on November 7th to bring home for the holidays. 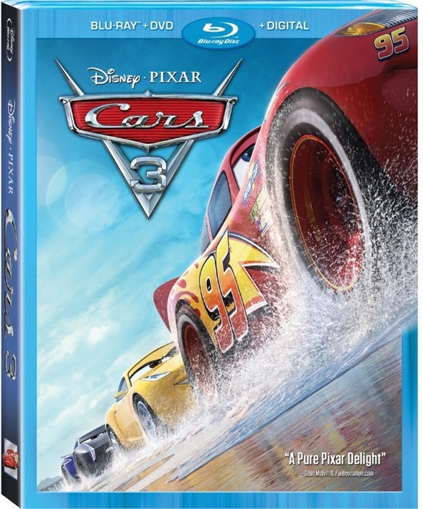 A perfect holiday gift for your Disney lover, Cars 3 on Blu-Ray makes a great edition to your family movie night. Let’s. Get. Crazy. – Go behind-the-scenes and see how Pixar puts the crazy in the Thunder Hollow Crazy 8 race. This piece is hosted by Lea DeLaria. Cruise into a fabulous Cars 3 movie night at home with this Fabulous Lightning McQueen Smoothie Recipe. 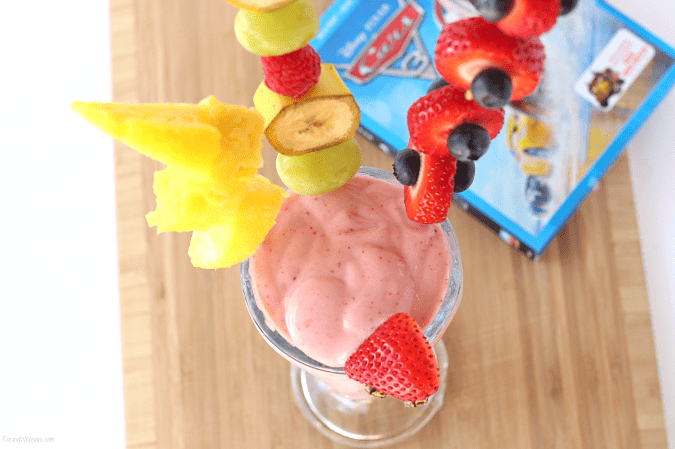 Inspired by Disney Cars very own Lightning McQueen, this healthy and fruit filled smoothie is perfect for sipping while you enjoy the newest Pixar Cars Blu-Ray release. Ready to race into a delicious inspired Disney drink? 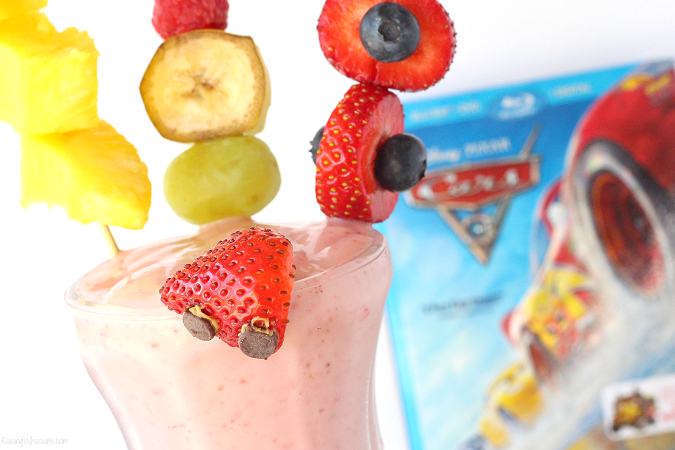 Celebrate Disney's Cars 3 home release on Blu-Ray with this delicious and healthy Fabulous Lightning McQueen Smoothie - complete with tires, stoplights and a fabulous bolt of lightning. Cut 3 pieces of pineapple into about 2 inch long strips, about 1 - 1.5 inches thick. Cut two of the stripes into long triangle shapes. 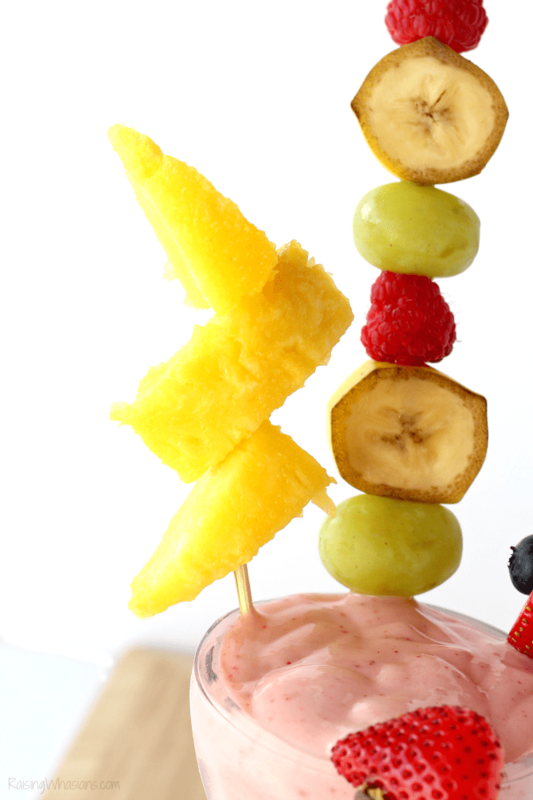 Arrange pineapple into lightning bolt shape (with the two triangle pieces on either end). Secure with toothpicks. Place lightning bolt onto a long skewer. Cut fresh strawberries into 1 inch thick circles. Place on skewer. Add blueberries to the centers of the strawberries, securing with toothpicks. 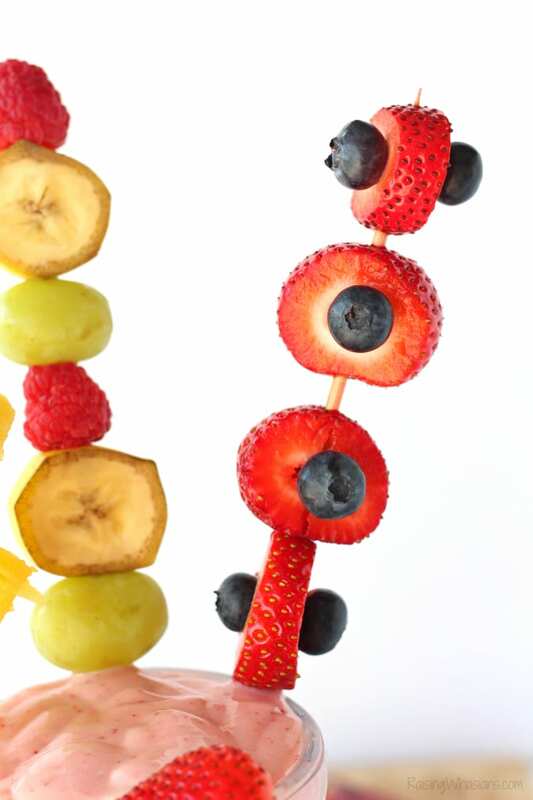 On last skewer, add green grapes, circle slices of banana and raspberries to create "traffic light" skewer. Combine one banana, 1.5 cups frozen strawberries and 1 cup of strawberry yogurt. Blend until smooth. 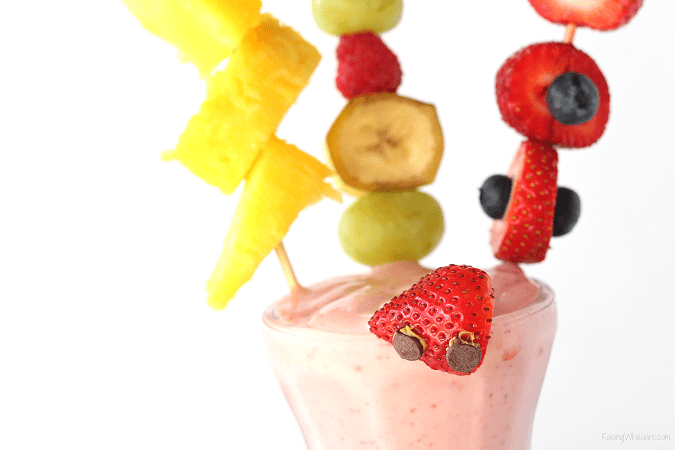 Place smoothie in cup, adding 3 fruit skewers. Cut top off one strawberry. Cut slit down center of strawberry, lengthwise. Add two chocolate chips to bottom end (as tires) & press in, using peanut butter to help hold in place if desired. Carefully place strawberry "car" to the rim of the smoothie cup. Serve immediately. Refrigerate or freeze leftovers. YUM! How fun would this smoothie be for your little Disney Cars fan? But even better thank sipping on a fabulous Lightning McQueen smoothie is enjoying this Disney inspired drink while watching the all-new Disney Cars 3 on Blu-Ray! 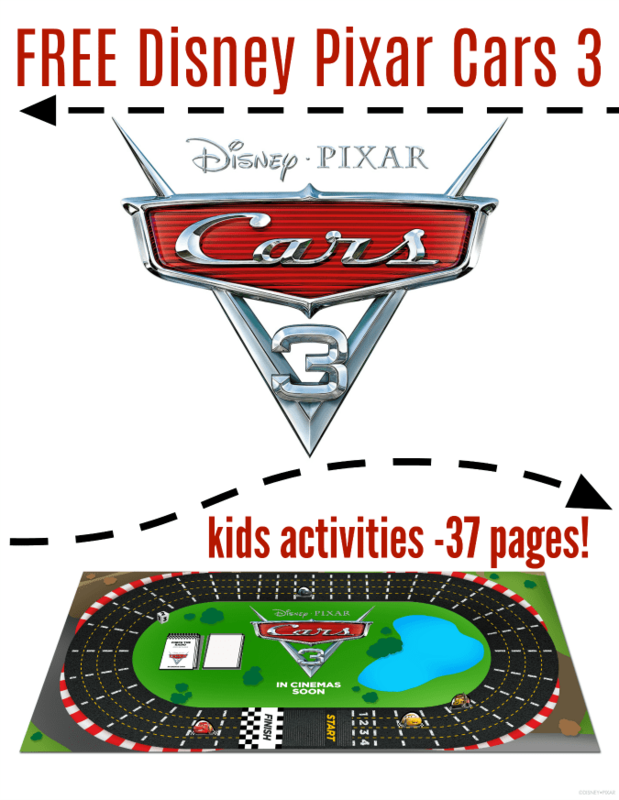 Be sure to grab your 37 FREE Cars 3 Kids Activity Pages + make your own DIY Juice Box Balloon Race Car to keep the Disney Cars 3 fun racing into the holiday season. Who has Disney Pixar’s Cars 3 on Blu-Ray on their holiday wish list this season? Be sure to follow Raising Whasians via Facebook, Twitter, Google, Instagram, Pinterest and YouTube for Disney movie reviews, Disney World park updates and more. My son definitely does!! We LOVED the movie!! This smoothie looks delicious and nutritious! What a great way to celebrate the release! My family would love this fruity smoothie. We will enjoy this while snuggling up to watch the movie. My kids loved it at the theater and are excited for the dvd as well. My grandsons want this movie for Christmas this year! What a delicious smoothie! This smoothie looks delicious. We just watched Cars 3 today and my grandson loved it.